We are used to thinking of oil, and other hydrocarbon fuels, as highly valuable mineral resources that almost guarantee major profitability. We have been taught to see things that way by a dizzying array of special incentives, protections, direct subsidies and market conditions, that combine to make it possible to cover most of your costs in the fossil fuel business using other people’s money, while the overall framework of our economic activity blocks out meaningful competition. The perception that fossil fuels are “cheap”, that they are the most “convenient” way to access, transport and release naturally occurring energy, and that investors are virtually guaranteed high returns, is a major contributing factor to the dominance of fossil fuels the world over. The story of fossil fuel costs, however, is rapidly changing. For decades, the tug of war over the increasing difficulty of locating and harvesting these finite resources has caused investors, executives and governments, to worry about escalating risk, decreasing returns, and unfavorable cost projections. In September 2013, the IPCC’s 5th Assessment Report cited a scientifically determined global lifetime carbon emissions “budget”; all fossil fuel reserves beyond that threshold are “unburnable”, due to the thermodynamic impact of excess concentrations of heat-trapping gases and the decline in overall economic health and vibrancy that comes with that impact. 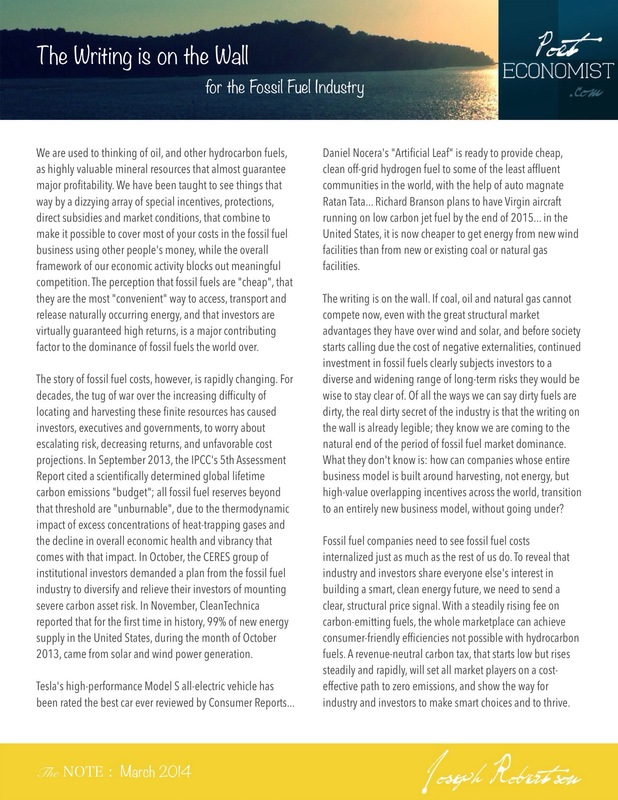 In October, the CERES group of institutional investors demanded a plan from the fossil fuel industry to diversify and relieve their investors of mounting severe carbon asset risk. In November, CleanTechnica reported that for the first time in history, 99% of new energy supply in the United States, during the month of October 2013, came from solar and wind power generation. Tesla’s high-performance Model S all-electric vehicle has been rated the best car ever tested by Consumer Reports… Daniel Nocera’s “Artificial Leaf” is ready to provide cheap, clean off-grid hydrogen fuel to some of the least affluent communities in the world, with the help of auto magnate Ratan Tata… Richard Branson plans to have Virgin aircraft running on low carbon jet fuel by the end of 2015… in the United States, it is now cheaper to get energy from new wind facilities than from new or existing coal or natural gas facilities. The writing is on the wall. If coal, oil and natural gas cannot compete now, even with the great structural market advantages they have over wind and solar, and before society starts calling due the cost of negative externalities, continued investment in fossil fuels clearly subjects investors to a diverse and widening range of long-term risks they would be wise to stay clear of. Of all the ways we can say dirty fuels are dirty, the real dirty secret of the industry is that the writing on the wall is already legible; they know we are coming to the natural end of the period of fossil fuel market dominance. What they don’t know is: how can companies whose entire business model is built around harvesting, not energy, but high-value overlapping incentives across the world, transition to an entirely new business model, without going under? Fossil fuel companies need to see fossil fuel costs internalized just as much as the rest of us do. To reveal that industry and investors share everyone else’s interest in building a smart, clean energy future, we need to send a clear, structural price signal. With a steadily rising fee on carbon-emitting fuels, the whole marketplace can achieve consumer-friendly efficiencies not possible with hydrocarbon fuels. A revenue-neutral carbon tax, that starts low but rises steadily and rapidly, will set all market players on a cost-effective path to zero emissions, and show the way for industry and investors to make smart choices and to thrive.